Ashley Marie Witter’s artwork is beautiful. Every page captured the depth and richness of Anne Rice’s world. With splashes of color here and there, adding a sense of power and emotion through art, this book is truly visually captivating. I loved every lavish page, every panel. The artwork is phenomenal. This graphic novel is the retelling of a dark and tragic story every Anne Rice fan knows and knows well. The story of a woman eternally trapped in the body of a child. Her lost innocence, her corruption and her restlessness. Parts of Rice’s original novel can be found in this adaptation word for word. Lines directly from the original placed in a sea of gorgeous imagery. Ashley Marie Witter taking on Claudia’s point of view was quite a task, but she did decently enough. As an avid Anne Rice fan, I can’t help but think that only the author herself can speak for Claudia. But overall, I feel that Witter captured Claudia well. In the end, I loved this graphic novel. The artwork was elegant and gorgeous and the story was heartbreaking , yet captivating. This is a book I recommend both Rice fans and those who have never read her novels. It’s been a long time since I read Interview, but I remember how compelling and tragic a character Claudia was. She’s really the soul of the book, and maybe of the entire Vampire Chronicles. (I haven’t read all of them though.) Focusing on her story was a great idea. from the time she & her mother kill by the rays of sun in that round chamber. It wasn’t her mother. 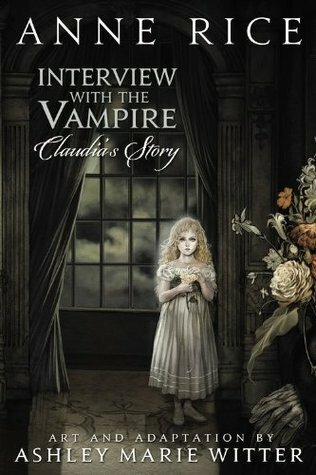 It was a doll shop owner Claudia liked and had Louis turn into a vampire. This graphic novel retells the story of Interview, but from Claudia’s point of view instead of Loius’. The story ends when Claudia dies.